The Oakland Music Festival will forever hold a special spot in our heart. Afterall, OMF was the first event that we covered, and just like Nook and Kranny has evolved so has OMF. This year, instead of just one day, the festival is going to be A WHOLE WEEK LONG. Yes, a whole week of great vibes, good music, and amazing conversations. This week long bash definitely has something for everyone, and we’re gonna be in the building and would love for you to join us. Tag OMF and Nook and Kranny on the post. ONE lucky winner will get a pair of all access passes to enjoy the week of festivities. 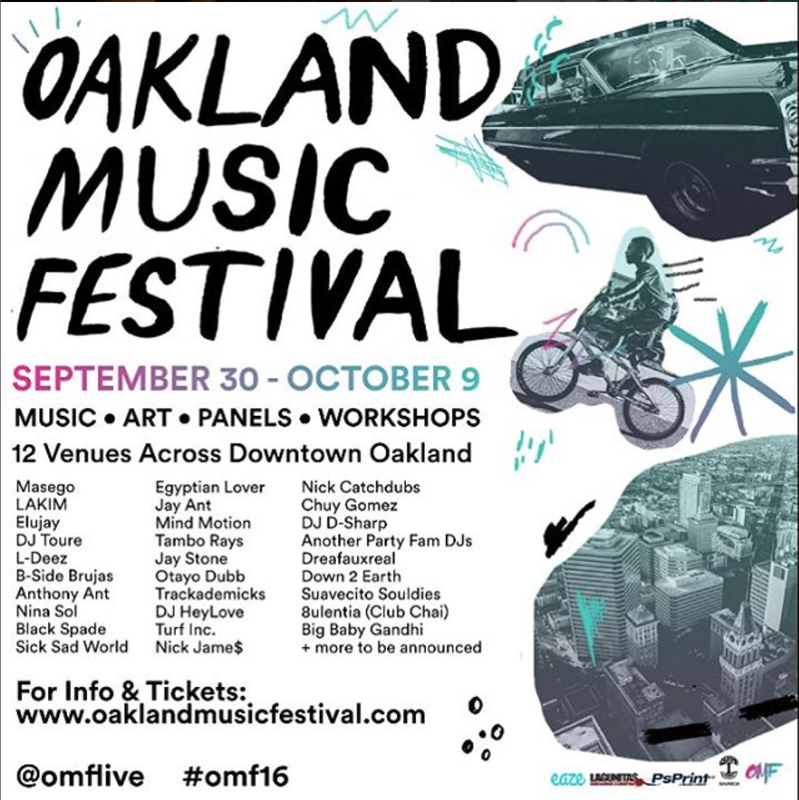 Check out the official Oakland Music Festival schedule below. For the full OMF experience, they are offering a weeklong All-access Pass for $75. All-access will get you into all our ticketed events for the week for one low price, in addition to our official #OMF16 swag bag, a commemorative t-shirt and special VIP-perks throughout the week of the festival. CreativeMornings is a monthly breakfast lecture series for the creative community. Each event is free of charge, and includes a 20 minute talk, plus coffee! Nothing says Oakland like a party at the Lake. Taking over Legionnaire for this free day party, expect Suavecito Souldies to play everything from sweet soul, northern, Panamanian, boogaloo, chicano, and other soulful sounds. DISCLAIMER: Mezcal + Tequila bar + vinyl DJ sets by Oakland-based vinyl DJs that are changing what music looks and feels like. Spinning oldies, cumbias, boleros, soul, and more, these four women use their music to heal and spread the right energy at the right time. With purchase of ticket you will get a crash 101 course on sipping Mezcal. The 2016 Oakland Music Festival invites you to join industry professionals and prominent creators for a 2 hour networking event at 25th Street Recording Studios in Uptown Oakland. A chance to connect with Bay Area artists, performers, producers, engineers, curators and the like. Funk + Blues + Electronic + Soul + Hip Hop +Jazz all in ONE night. Head to the Oaklandish shop on First Friday for this FREE pop-up artist showcase featuring some of the Bay Area’s best in new talent in hip-hop//soul — emcee Elujay and R&B singer Rayana Jay. \After the (Oaklandish) party it’s the after party, co-headlined by the fearless leader of the Traphouse Jazz Band (better known as Masego) and The Bay’s own rapper/producer extraordinaire Jay Ant. Set against one of Oakland’s most unique venues in the form of a boutique vintage car showroom and multi dimensional gallery/art space — plus the launch of Oakland’s newest clothing shop 411. Headlined by local indie pop rockers The Tambo Rays and Club Chai’s 8ulentina, we’re closing out the week in style. Enjoy a full selection of local craft beers on tap in the outdoor beer garden a raise a glass to OMF 2016’s closeout event, hosted in collaboration with 411 Oakland. Seriously, if you don’t make it out to OMF this year, you will seriously regret. And remember, if you see the Nook and Kranny Squad be sure to say hey. See you all soon, and good luck on the raffle.